Presidential inaugurations are occasion for repeating certain pieties. As Thanksgiving is to gratitude, and New Year’s for hope, the quadrennial 20th of January is for paeans to the peaceful transfer of power. But Donald Trump’s inauguration is not evidence the system worked. Trump is president because the system failed. Barack Obama governed wisely and honestly, and presided over peace and prosperity, and was rewarded with an approval rating of 60 percent. He is being replaced by a swindler who has been consistently opposed by a clear majority of the public. This happened because of a combination of oddities and systemic abuses: an Electoral College system that allows the second-place candidate to win if his supporters happen to be distributed more optimally; the dramatic intervention of the FBI on behalf of the Republican challenger; the Twenty-second Amendment, which prevents the popular incumbent from running again. All these factors in combination have produced a dramatic transfer of power from a president who has the support of a clear majority of the country to one who does not. The system did “work” in the most minimal fashion. Power was transferred nonviolently in accordance with the law, and the result was openly accepted by the opposing candidate and the incumbent president. But this small comfort is smaller than it might appear. Trump has consistently expressed the belief that a process that does not end in his chosen fashion is illegitimate. When it appeared briefly in 2012 that Obama would lose the popular vote while winning reelection, he called for revolt. When he lost primaries to other Republicans, he called them rigged. He invented voting-fraud conspiracies in the fall, telling wild lies about millions of fraudulent votes for his opponent. The system appears to be working because the candidate who refuses to accept defeat was not defeated. But this merely postpones rather than answers the test of American democracy. In his presidential announcement speech in 2015, Trump hired actors to pretend to be supporters, and then, characteristically, refused to pay them. He boasted this week that he was writing his inauguration speech, even displaying a photo of himself purportedly working in Mar-a-Lago. (In a touch that could have come straight from a David Mamet film, the backdrop to Trump’s speechwriting scene turns out to be a corridor, the desk belongs to an administrative staffer.) Trump is a con artist, and a very good one. It requires enormous talent of a kind to successfully identify and exploit new marks, for decades, without their catching on to you. Constantly luring new contractors, partners, and customers to place their faith in Trump so he can exploit them is a difficult ruse to sustain. The gall of Trump’s populism is astonishing. “For too long, a small group in our nation’s capital has reaped the rewards of government while the people have borne the cost,” he announced, shamelessly. “Washington flourished, but the people did not share in its wealth. Politicians prospered, but the jobs left and the factories closed.” This from the first president in decades to refuse to disclose his tax returns, and the first in centuries to use the presidency to enrich himself and his family! The presidency raises the stakes of Trump’s con game to a completely new level. 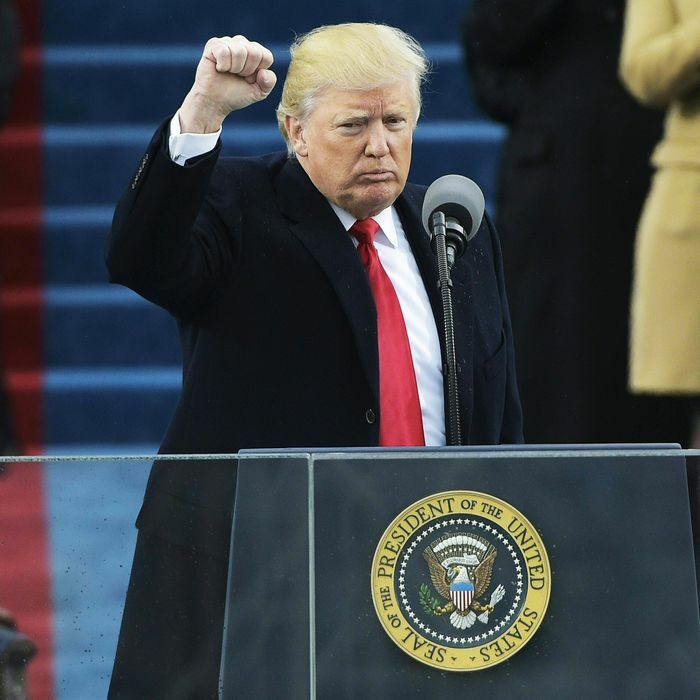 In his inaugural address, Trump declared his fealty to the People, promising to unleash untold wealth to them that was being held by elites in Washington and by foreigners. “We will bring back our jobs,” he said. “We will bring back our wealth.” He promised to quash crime and “eradicate” Islamic terrorism “from the face of the Earth.” The grandiosity of these promises is necessary to get even the minority of the electorate that can tolerate Trump to overlook his overt grossness and corruption. The methods of a skilled con artist have worked just barely well enough to deliver the presidency to Trump. But what happens when his grandiose promises fail to materialize? And when the aspects of his program that he never mentioned in his speech — tax cuts for the rich, stripping away health insurance from millions, massive graft — do take place? A con artist who always escaped his old victims and found new ones has reached the maximal limits of his strategy. What happens when the marks are demanding that the promises he made be redeemed, and there is nowhere for him to go, and he commands the powers of the state?